Here is extracts from The Coastal Express' route planner, showing ports of call and hours in Finnmark County. If you for instance are visiting North Cape with car, you can enter The Coastal Express at Honningsvåg going to Kjøllefjord or Mehamn, thereby having the opportunity to visit the naked and beautiful Norkyn peninsula. From here you may drive further over the Ifjord plateau (often closed in the winter) through the Tana valley and to the Varanger fjord. 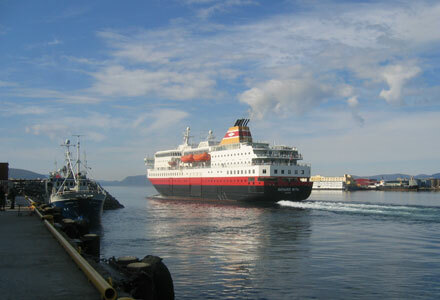 For further information, look on the web pages to Hurtigruten. *) In summer time (June - August), departure time is fixed to 11.45 hours. Copyright © Ekkerøy AS 2002-2017. All rights reserved.